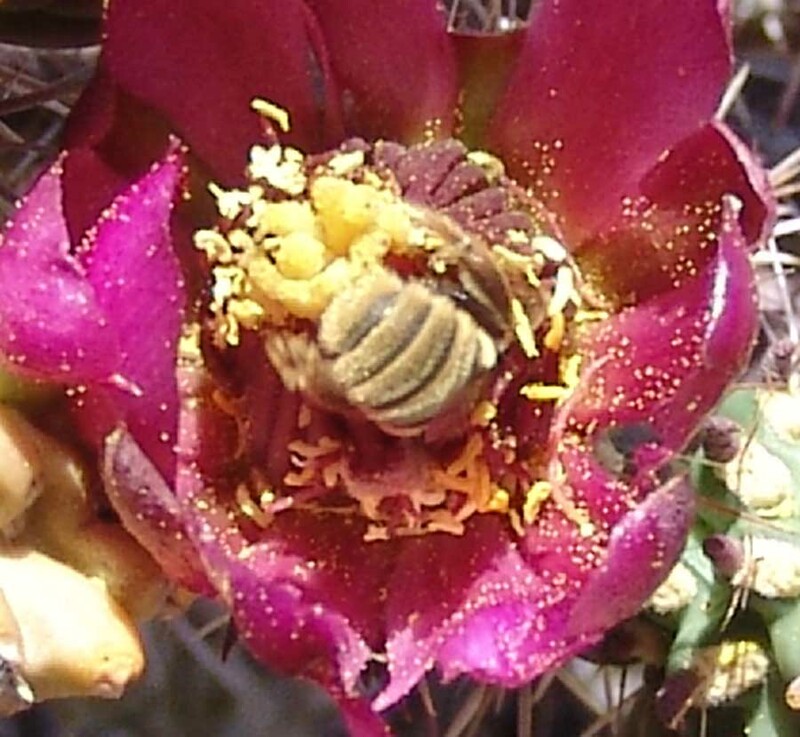 Main sources: O'Toole, Christopher & Anthony Raw, 1991, Bees of the World, London: Blandford; Batra, Suzanne, 1984, "Solitary Bees", Scientific American 250:2:120-27; "Cactus Bees", The Bee Works (thanks to Dr. Stephen Buchmann); Buchmann, Stephen & Gary Nabhan, 1996, The Forgotten Pollinators, Washington DC: Shearwater Books; Chambers, Nina et al, 2004, Pollinators of the Sonoran Desert: A Field Guide, produced in partnership by the Arizona-Sonora Desert Museum, International Sonoran Desert Alliance, and The Bee Works. 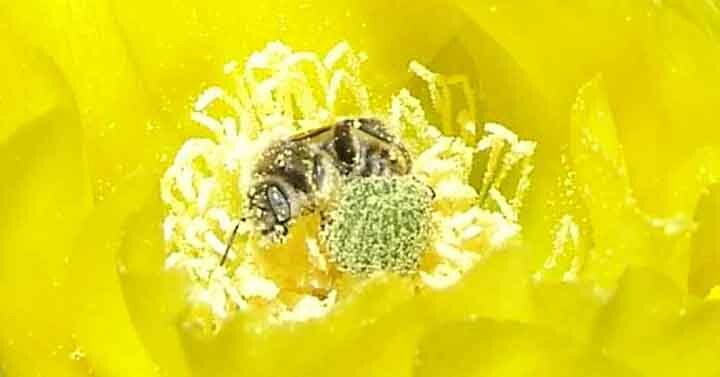 While most of us think of swarms, hives, queens, workers, honeycombs, and stings when we speak of bees, and believe people have to bring in professional hive keepers to ensure that local crops get pollinated, more than 85% of the some 20,000 species of bees in the world don't fit this image -- they are "solitary", meaning they have no socially structured specialization of workers and queens, rather each female bee builds her own nest, provides nectar and pollen in each cell for her larvae to eat lays eggs in its cells, and then seals the nest and departs. 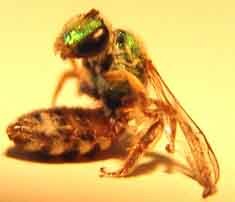 Typically this mother will die before her offspring emerge. 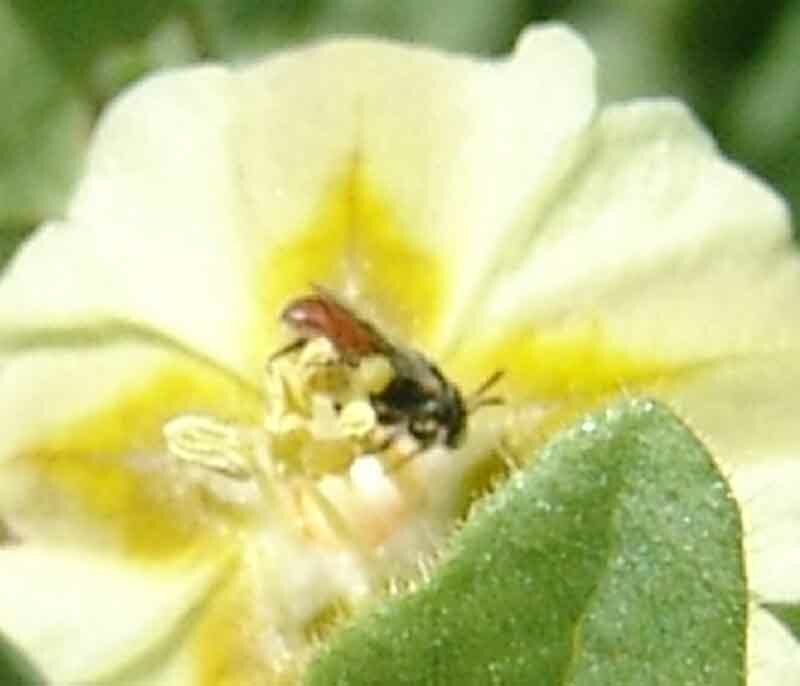 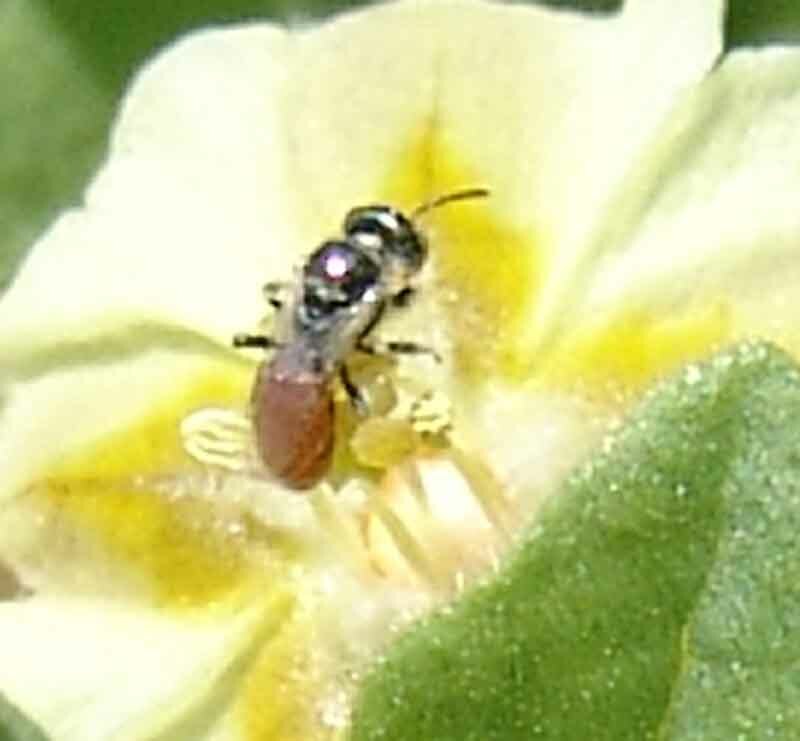 Solitary bees are highly diverse, found in nine distinct families -- including membrane bees, digger bees, sweat bees, leafcutter bees, mason bees, alkali bees, carpenter bees, miner bees, orchid bees, bumblebees, and others. 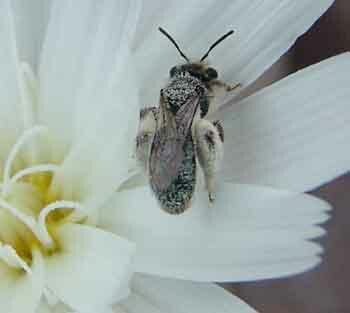 Most solitary bees make their nests underground, preferring sites where soil is exposed to morning sun, and in desirable locations they may form large "villages" of nests. 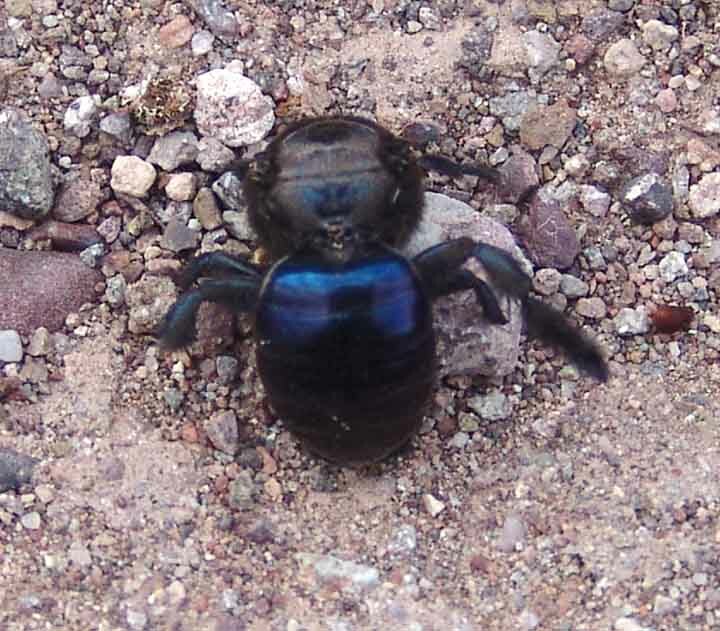 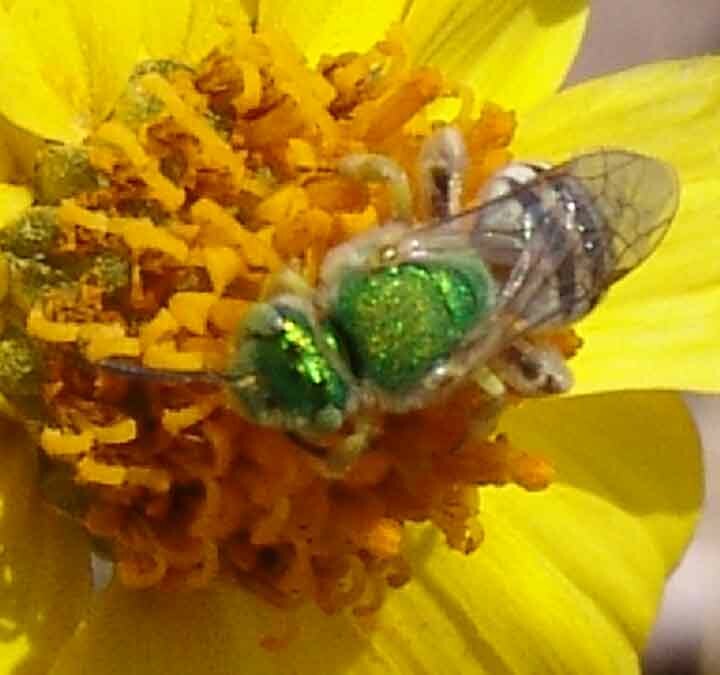 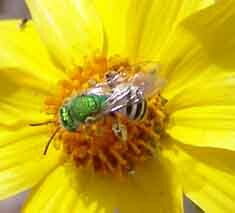 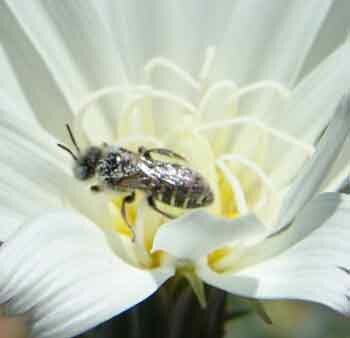 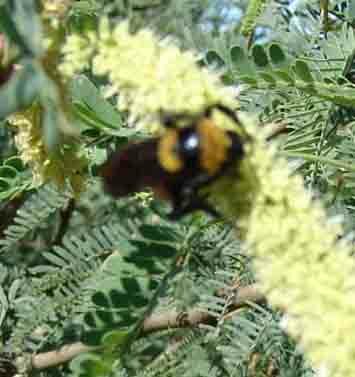 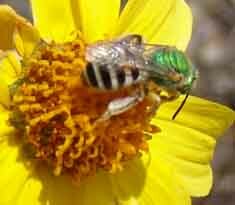 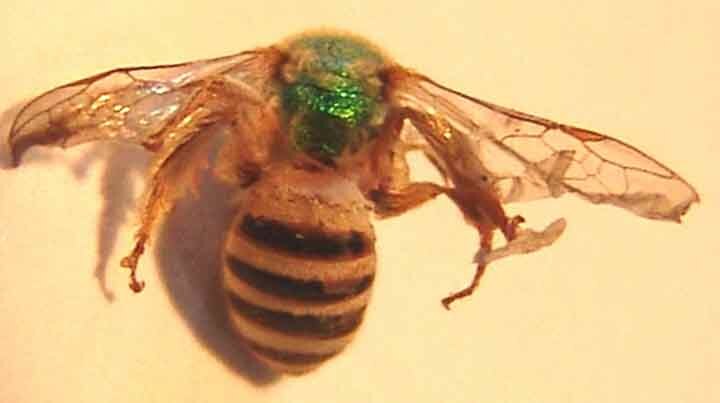 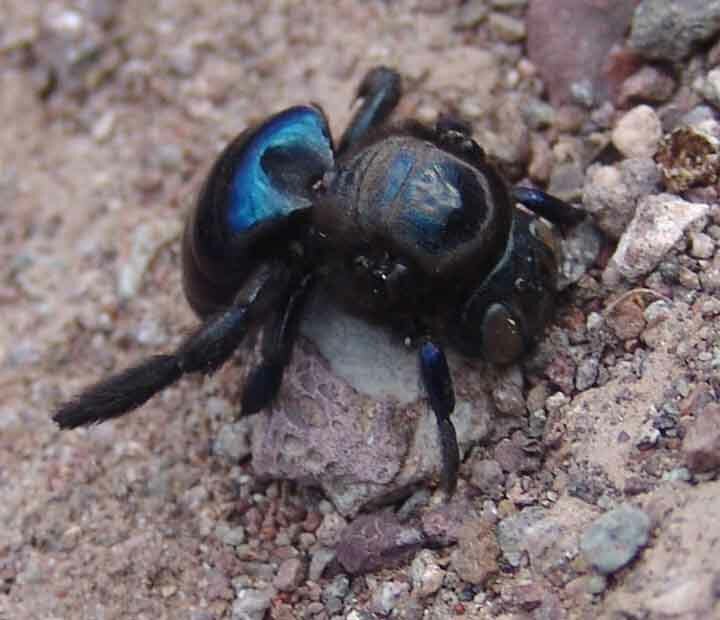 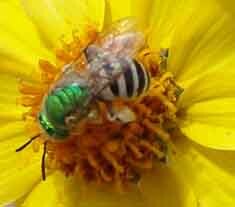 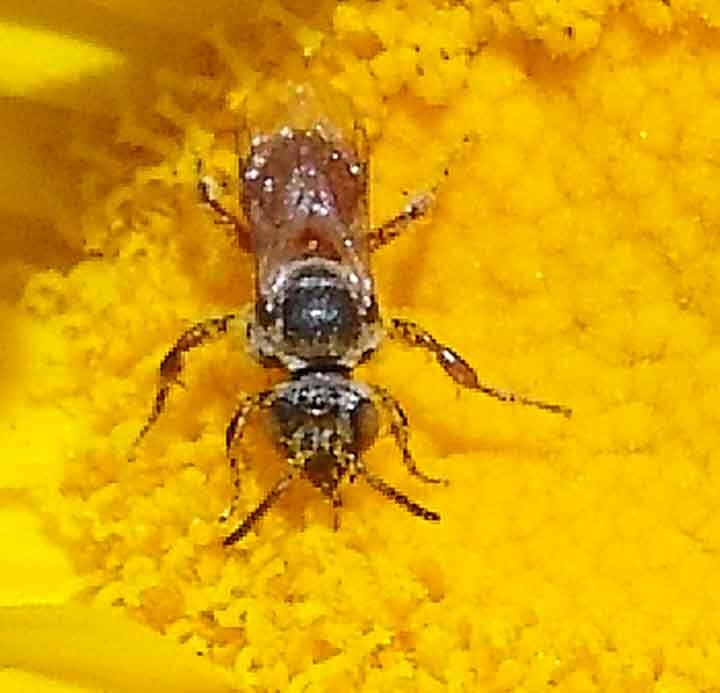 See Cactus Bees for one very important group of Solitary Bees found in our area. 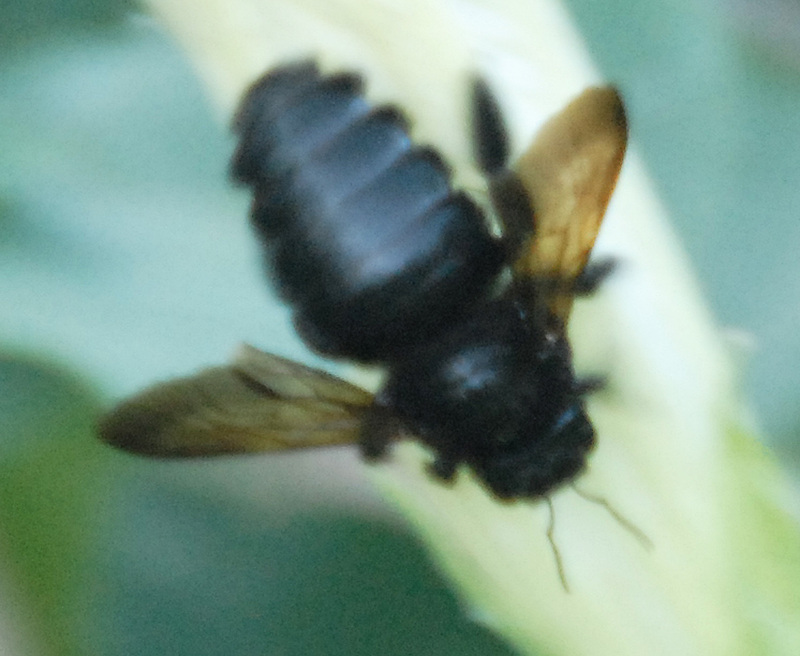 This corpse has lost some of its body parts, but it is probably a Xylocopa species, most of which are tropical to subtropical in distribution. 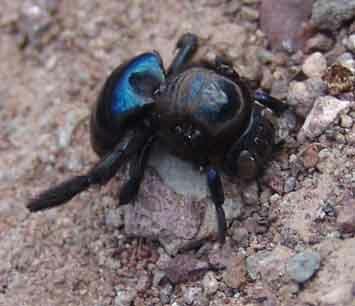 The female uses both sound and rotten wood to excavate a tunnel, running the main part along the grain of the wood. 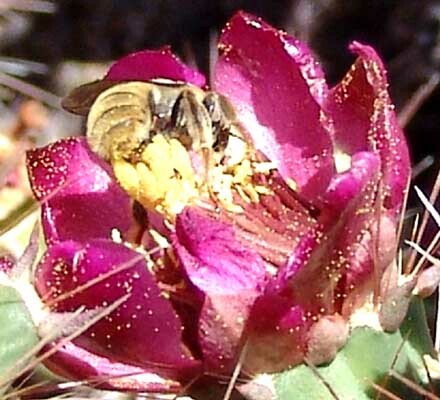 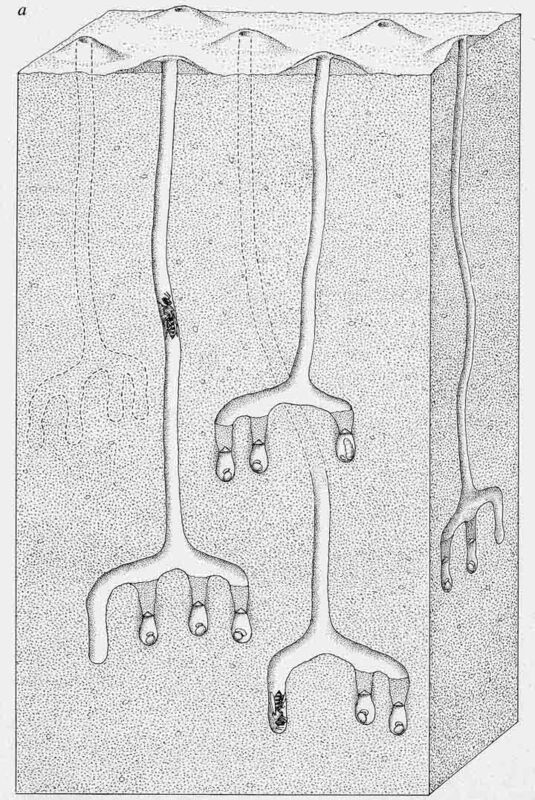 In desert areas some species line the tunnel with a waterproof secretion from their abdominal glands, which prevents dessication, and after the tunnel is finished they bring pollen into the cell before laying a large egg onto the mass. 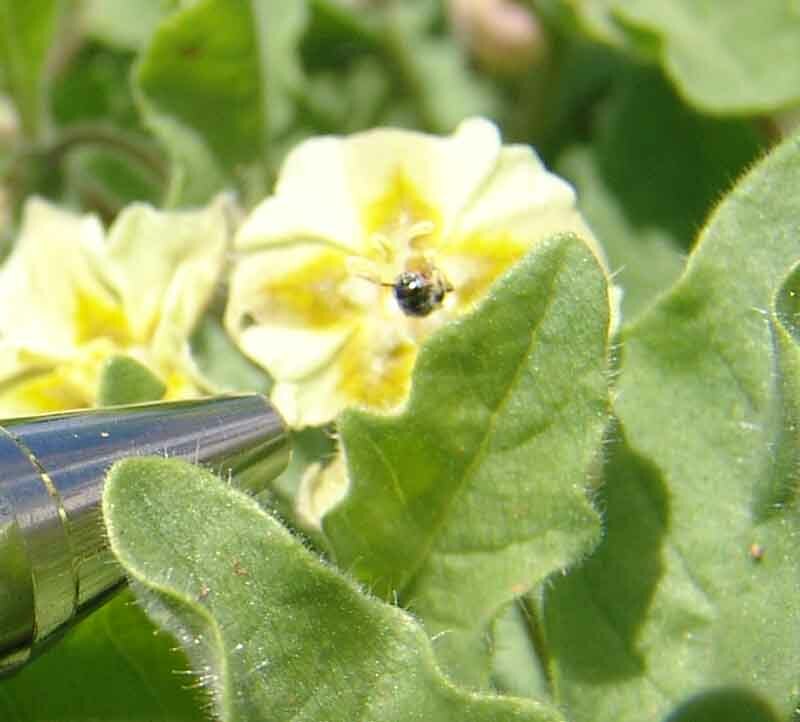 For scale, the diameter of the barrel-tip of the pen in the image second from the left above is about 3 mm. We found this one below dead in a Rain Gauge in Hot Springs Canyon in October 2005. 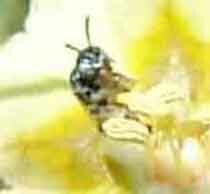 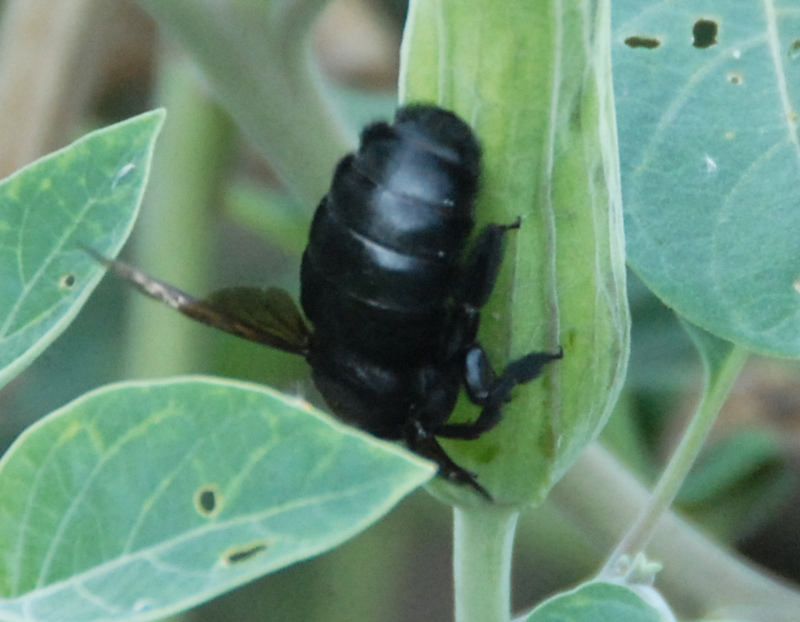 This one is quite small -- the length of its abdomen is roughly 6 mm. 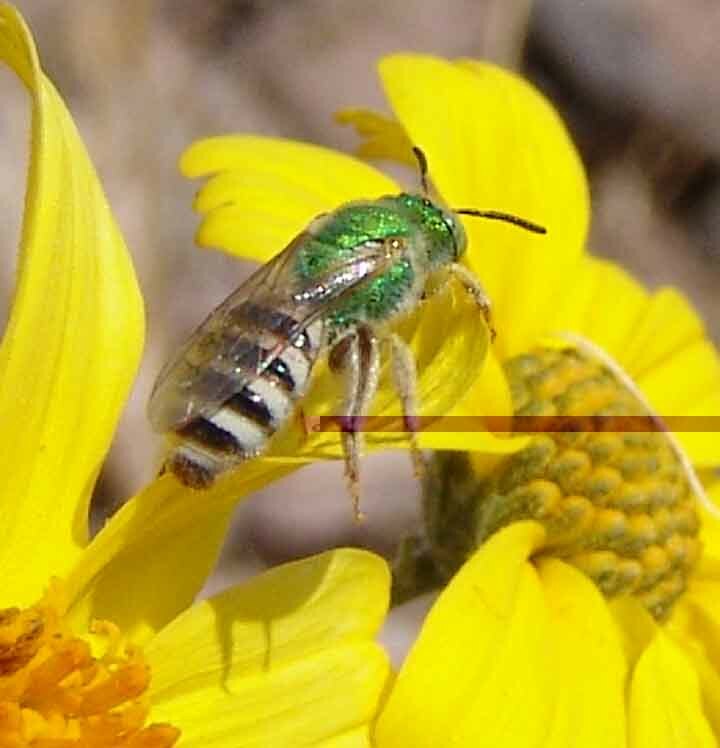 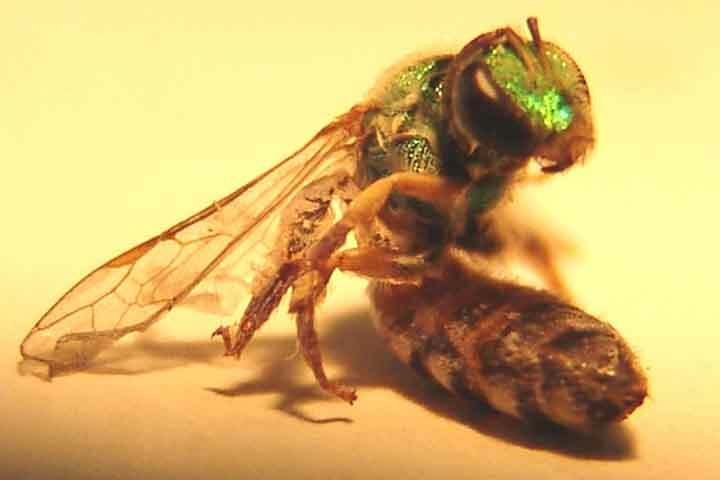 Most sweat bees nest in burrows in the ground, sometimes quite solitary, but often many of them nest close together, sometimes even sharing common passageways from their burrow to the outside. 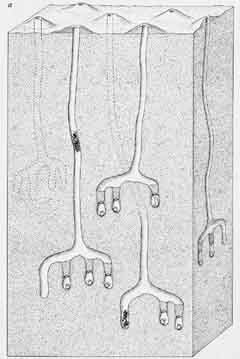 A few may be considered "primitive eusocials". 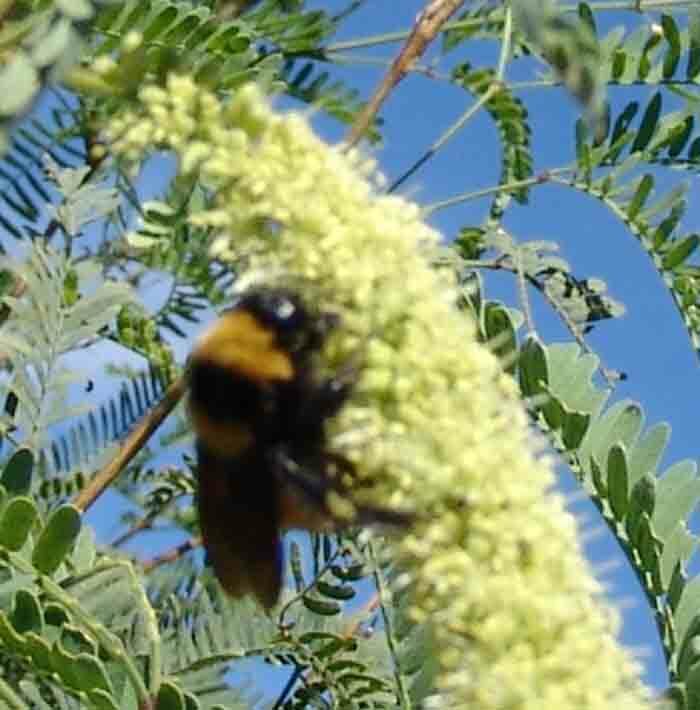 The image to the left (Click on the image to enlarge it) illustrates the nest-building process of an alkali bee (Nomia melanderi) [from Batra 1984:124]. Many other types of nest (including some drilled into wood, etc.) are constructed by other kinds of solitary bees.